✅PHONE PROTECTION: Holder grips and bottom bracket are made by silicone rubber, which is soft to protect your phone from scratching. ✅DROP AND CHARGE: One hand operation, drop and charge, done with one second. Save you from the tangled locating cords or cables. ✅SAFETY PROTECTION: Built-in intelligent chip with multiple protections, such as overcharge, over-current, short-circuit, temperature control etc. ✅2-IN-1 CHARGER: It combines a fast wireless car charger and a phone holder. Wireless quick charging your phone while navigating on the road. ✅ADJUSTABLE CHARGER: Press the button to adjust the length of the leg to accommodate with your phone. This car charger compatible with most sizes of cellphone from 4"-6". ✅FULL-CHARGED BATTERY: It will automatically stop charging while the phone is fully charged, and will start charging again once the battery drop from 100% to 99%, making sure a full-charged battery for you to go. -Package comes with USB Cable, AC Adapter and Car Cigar Lighter are not included. -Please remove metal ring holder, metal attachments and bank cards, for optimal charging. -Please adjust the bracket to make the center of the phone at the wireless charging center. It will fail to charge if placed improperly. ⚡ Powerful 10W & 7.5W Fast Charge: This car charger supports 10W Fast Charge mode (10% faster than standard 5W wireless charger) for devices like Samsung Galaxy S9, S9 Plus S8, S8 Plus, S7, S7 edge, S6 edge+, Note8; 7.5W Quick Charge for iPhone X, iPhone 8, iPhone 8 Plus. 5W standard charge for other devices.  360° Degrees Rotation & Two Installation Ways for Better Vision: Comes with a 360° highly flexible ball-joint. The wireless car charger can be rotated 360°for optimum viewing accessibility. Package includes a air vent clip and a sticky gel pad for sticking on dashboard. Choose the most proper installation way for your car. 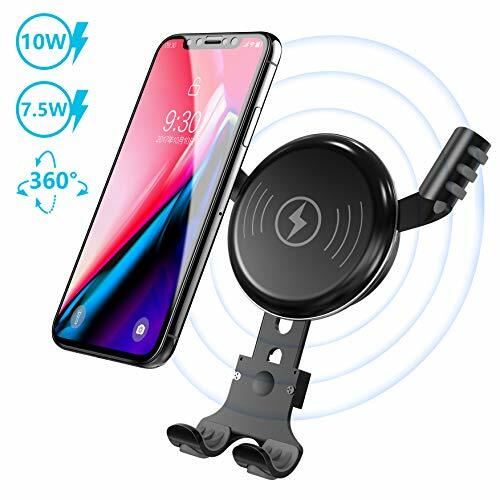 ✅ Premium Aluminium Alloy Design & Soft Anti-slip Rubber: Compare to most wireless car charger made by plastic in the market, this wireless car charger is made by aluminium alloy. Looks more premium and cool in your car, say goodbye to cheap plastic material. Build-in anti-slip silicone rubber strips on two arms and feet to enhance buffering effect and thus lock your phone firmly even on a bumpy road. Meanwhile, prevent your phone from scratching.  Safe for Driving: With the aid of gravity design, you just need to put down your phone and the wireless car charger will charge automatically. Lock up and release your phone with a single hand, save the trouble of attaching/detaching the cable, quick and convenient. ⭐ Case-friendly: Built-in intelligent large coils, offering uninterrupted power while charging your phone. Senses your phone within 8mm, charge your phone through your phone case. If you have any questions about this product by BESTHING, contact us by completing and submitting the form below. If you are looking for a specif part number, please include it with your message.